This week our week(end) preview actually starts on Monday as we kick off a full schedule of fine arts events through the end of the year. From the final Transfer of Memory exhibit events to the final Gustavus Artist Series performances, it’s going to be a jam-packed week. This marks the final week of the Transfer of Memory exhibit at the Schaefer Art Gallery. The exhibit features photo portraits of Holocaust survivors living in Minnesota, at home in full color. Accompanying the exhibit is two weeks of special programming, including children of Holocaust survivors telling their parents’ stories. This coming week features the three final events. More information about this exhibit and the programming surrounding it can be found here. David Briggs is an internationally renowned organist whose performances are acclaimed for their musicality, virtuosity, and ability to excite and engage audiences of all ages. With an extensive repertoire spanning five centuries, he is known across the globe for his brilliant organ transcriptions of symphonic music by composers such as Mahler, Schubert, Tchaikovsky, Elgar, Bruckner, Ravel, and Bach. Briggs will also present a master class which is free and open to the public at 6 p.m. on Monday, April 8 in Christ Chapel. For concert tickets, please visit gustavustickets.com. William Chapman Nyaho is an active concert pianist performing as a soloist and chamber musician around the world. Appearances include soloing with the San Francisco Chamber Orchestra and the Moscow Chamber Orchestra, as well as featured segments on NPR’s Performance Today. Chapman Nyaho’s solo CD SENKU: Piano Music by Composers of African Descent, a ground-breaking compilation of music of the African Diaspora, was recently choreographed by the Tony Award winning Garth Fagan. Senku was named one of the “Best of the Year” by the Cleveland Plain Dealer, which called it “altogether enthralling . . . this music deserves a regular place on concert programs.” Gramophone Magazine said, “Nyaho’s gripping performances kept my ears glued to this disc . . . Let’s hope the pianist continues to explore and record more such commanding repertoire.” Dr. Maya Angelou wrote that it holds “moments of discovery so delicious that the listeners will be made to laugh out loud and to compliment not just Dr. Chapman Nyaho, but themselves at their good fortune in finding these composers and this pianist.” For tickets, please visit gustavustickets.com. 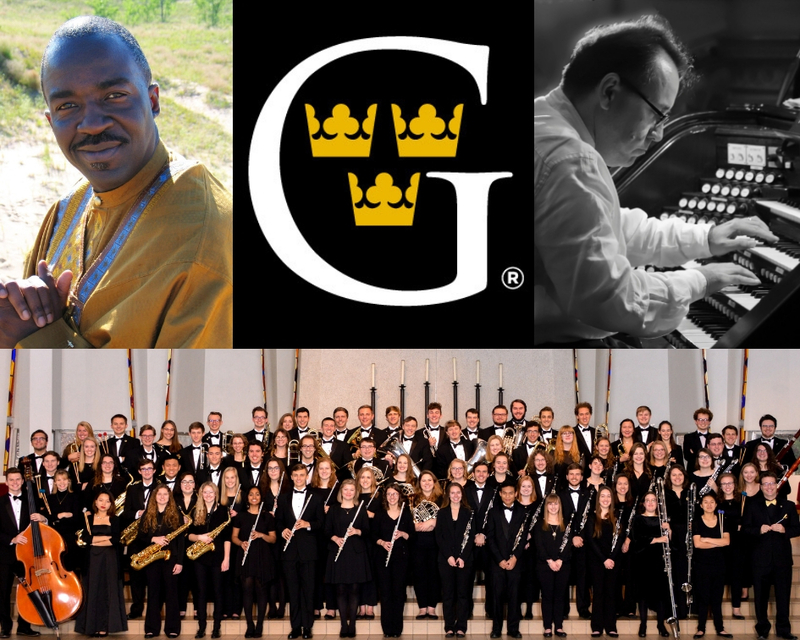 The Gustavus Wind Orchestra returns from a 10-day tour of Minnesota to present its home concert. The concert’s theme is “Solitude” and features a wide variety of repertoire for wind band including Karel Husa’s “Smetana Fanfare”, Percy Aldridge Grainger’s “Molly on the Shore”, as well as John Mackey’s “The Frozen Cathedral”. The program also features several student soloists, conductors, and performers. Senior dance honors and psychological science major Mia Massaro choreographed a dance for Warren Benson’s “The Solitary Dancer” and will perform it with the band. She will be joined in the spotlight by Charlie Barnhouse ’19 (saxophone), Oran Clay ’19 (tuba), Andrew DeLuca ’19 (guest conductor), and Emma Silber ’19 (guest conductor). The Choir of Christ Chapel, conducted by Brandon Dean, will sing as part of the Palm Sunday service in Christ Chapel. They will perform “O Clap Your Hands” by Ralph Vaughan Williams and “Give Me Jesus” arranged by Larry Fleming as part of worship.